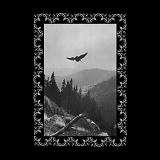 Hailing from Basqueland Ostots is engaged in what many one-man black metal projects do - promoting their own vision of the music, be it something entirely unique or reminiscing after the good old days. Two assumptions can be made while listening to the intro Sarrera. IA, the man behind the project, will be reveling in his riffs and the whole affair may be nature inspired. The first is certainly true, as riffs are a centerpiece on Hil Argi, but I have drawn quite a different mental picture, not simple nature gazing, while listening to the album. Where Hil Argi made me rise and pay notice are the places when IA delivered proud Iberian riffs invoking visions of barbarian honor and dignity (Gaua II Hil-argi), albeit with a very melancholic otherworldly sense. Blasting, marching, then blasting again, songs like Bide bakartia are momentum changers where my vision of Hil Argi crystallized. Without much bass or much snare, but with panoply of crushing cymbals, Ostots predominantly focuses on the prodigious guitars, yet they are also compressed in tone in a true old school lo-fi fashion. Add to this distorted beyond recognition evil troll vocals, and there is lots of them, since apparently IA has much to say in a way of a lyrical message, and the picture of Ostots will be somewhat complete. Perhaps not blessed with a ton of riff variety, Hil Argi excels in terms of its pure conviction. Bide bakartia and Gaua II Hil-argi rise as some epic warrior exultations, and ebullient nature of some cuts runs into an atmospheric introspective moment only to emerge with the storm raging on the other side (Itzas haizea). Shapeshifting across the album at one glimpse Ostots sounds like French Black Legions, some other moments it is not very different from a number of other European atmospheric black metal bands, but it is songs like Bide bakartia or Itzas haizea remind me of the old Windir a bit and that is a high complement. Not everything on Hil Argi is fast, Azken hegala is more deliberate, which actually makes it sound broader and more encompassing, the song taking on a feeling of a tired labor intensive procession. Being that I perceived Ostots to be a more heroic historic black metal, I would not mind for the sound to get a little more epic and refined as well. This is probably not going to happen since IA underground drive likely dictates the opposite.